Perhaps, you are one of those who are interested to learn how to grow money tree. If so, then you have come to the right place. Also, you have made the right decision for choosing to grow money tree. The tree is easy to care for and since it loves water a lot, you do not have to worry about overwatering it. The money tree plants originate from Mexico as well as in the northern part of South America. Moreover, these trees are usually grown indoors in a small pot. However, it could grow up to 60 feet tall in their native habitat. The plant features slim stems topped with palmate leaves. Furthermore, its trunks are knotted, twisted and braided. As such, it is sometimes called the braided money tree. From its native region, the money trees produce oval shaped fruits, where the inside is divided into five chambers. The seeds inside the fruit tend to swell until such time that the pod will burst. Interestingly, the tree got its name from a Feng Shui practice, which believes that such plant could bring luck to its owner. So if you want to try your luck in growing this tree, here are the steps on how to grow money tree. Image Credit: Seven Luck Nurseries Co., Ltd. Gather the seeds of the money tree as soon as the large seedpods that are shaped like coconut will begin to dry out or until such time that the pods will split open. Crack the pod to open. Gently gather the large seeds that are reddish brown in color. Check the seeds very carefully. Discard anything that has holes and other defects. Purchase the seeds from your local garden center or nursery store. Otherwise, you can go online and look for stores that sell these seeds. Prepare a container or pot for each seed to be sown. Fill the pot with a mixture of potting soil. Ideally, the soil should be consisting of 5 parts potting soil, 1 part perlite and 2 parts coarse sand. Pour water into the pot until such time that the potting soil is saturated. Allow the excess water to drain off for about 15 to 20 minutes. Sow one seed in each pot for about ¼ inches deep. Position the money tree seed at the planting holes such that the pale spot at the end will point sideways. This spot is also known as the eye. Afterwards, water the seed in order to settle into the soil. Pour more soil when it settles too much and end up exposing the seeds. Place the pot in an area that is warm and bright. For instance, you can place it by the windowsill. If you prefer to grow outdoors, you can place the pot in the south facing area of the porch. Warm the pot to about 80 degrees Fahrenheit with the use of a propagation mat. Afterwards, cover the pot with a plastic wrap if you’re using a propagation mat outdoor. Always check the moisture content of the soil. If possible, do so every single day especially if you are growing outdoors in a propagation mat. The mat could cause the plant to dry out fast. Water the plant up to two inches deep if it feels very dry. Watch out for the emerging seedlings that should appear after about a week. If you’re using a propagation mat, then take off the mat as soon as the plant begins to sprout. Continue watering your money tree as before. One of the most important money plant care instructions is to avoid pouring water directly to the seedlings. Doing so will only increase the plant’s risk of developing bacterial and fungal infections. Aside from learning how to grow money tree, you also should learn how to care for money trees to ensure successful growth of the tree. If you don’t know anything about care of money tree plants, then all the efforts that you will put into growing your money tree will go to waste. So here are some tips when it comes to caring for your money tree. •	Water the plant after every 7 – 10 days. If the top four inches of the soil is showing dry, then water it immediately. Keep the deeper soil to stay moist at all times, but not very wet. Furthermore, your trees will need more water during hot weather or when the air indoor is dry. Mist the tree daily in order to provide for extra humidity, which the tree needs in order to grow. •	Increase the humidity in your home indoors by placing the pot in a saucer that’s filled with pebbles. Fill the saucer with water, as the evaporation will enhance the overall humidity of the surrounding areas. •	Apply a quarterly dose of money tree fertilizer to feed your plant. This is an important step on how to care for money trees. Feed it twice in a month with half strength fertilizer that’s water soluble, especially during summer and spring. The money tree fertilizer will provide enough nutrients that your tree needs in order to grow. •	Another important tip on money tree plant care that you should know is when would be the perfect time for money tree plant pruning. Regular pruning is not really necessary for your money tree. However, you can trim the plant in order to shape and remove yellow leaves and other damages. 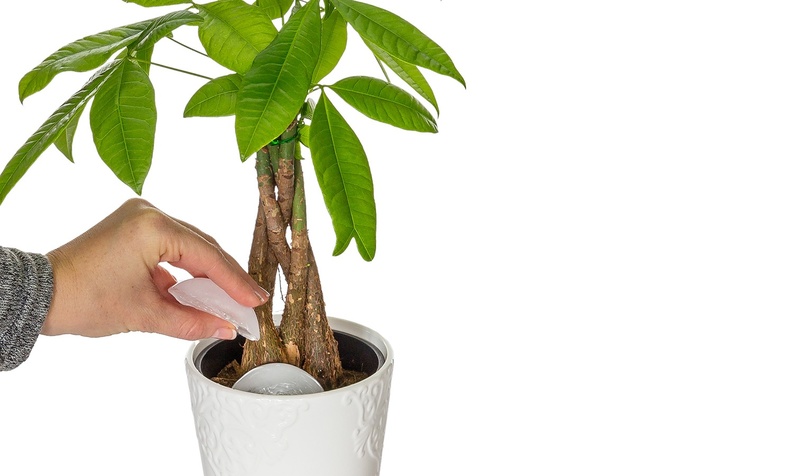 Use a pair of sharp scissors that’s ideal for money tree plant pruning. •	Continue braiding your braided money tree as it grows. Secure the new growth by putting a twine right above it. Braiding should be done while the plant is young and still flexible. Take off the side branches that could disrupt the braid. •	Before repotting, grow the seedlings for one growing season in an area that’s bright and exposed to indirect sunlight. Provide frequent watering on the seedlings during summer or when the weather is hot. However, decrease your watering by half in the winter. •	Repot your container grown money tree after every two years. A bigger container will give the roots of the plant enough room to grow. As a result, your money tree will grow bigger as well. Use a much larger container for repotting. Pour in commercial potting mix that has perlite or peat moss before replanting. This is to provide enough drainage and proper water retention for the tree. •	Check the leaves of your money tree regularly. Brown and crispy leaves could mean dry air and low light level. Moreover, dropped leaves are due to relocation shock. When this happens, do not give up. The leaves will eventually grow back with proper care. •	Keep the tree away from air conditioning and heating vents, as well as cold drafts from doorways or windows. •	Place the tree in bright and warm location and leave it there. Consider increasing the humidity surrounding the plant as this could help in its successful growth. Do not ever overwater the plant no matter how tempting it may seem. Your money tree could bring you fortune and luck. So treat your money tree well and make sure you refer to the tips above when it comes to its proper care. Above all, follow all the steps above on how to grow money tree.